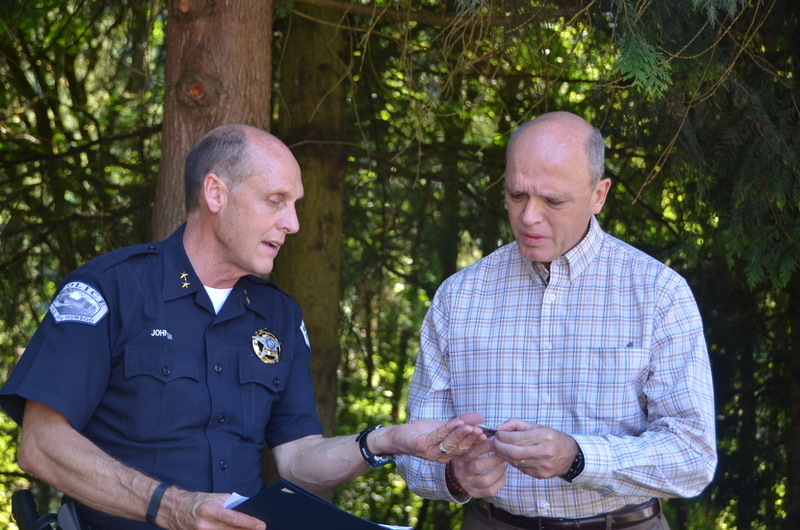 LAKE OSWEGO – On Monday, July 28, 2014, former Portland City Commissioner Charles “Randall” Leonard was presented with Chief’s Challenge Coins from the Lake Oswego Police Department and Lake Oswego Fire Department. Leonard was recognized for his quick response and commitment to get involved in rescuing a woman who was attempting to commit suicide. The incident occurred on Wednesday, June 23, 2014, at about 5:00 p.m. on the Oswego Creek Bridge on Highway 43. Leonard was driving by the location that day when he noticed a woman sitting on the ledge of the bridge. He said that it took him a couple of seconds to recognize what was happening, but, when he did, he immediately turned his car around and parked on the bridge. He grabbed the woman around the waist, but she began to struggle and try to jump. He held onto her and yelled out to a nearby man to help him. The other man came over and helped get her off the ledge and onto the sidewalk. Once she was on the sidewalk, the first officer arrived on scene and the other man left and was not identified. The woman was taken to a nearby hospital for evaluation. Officers determined that the woman was intending to jump off the bridge. Without the quick action of Leonard and the other man, she would have been successful. 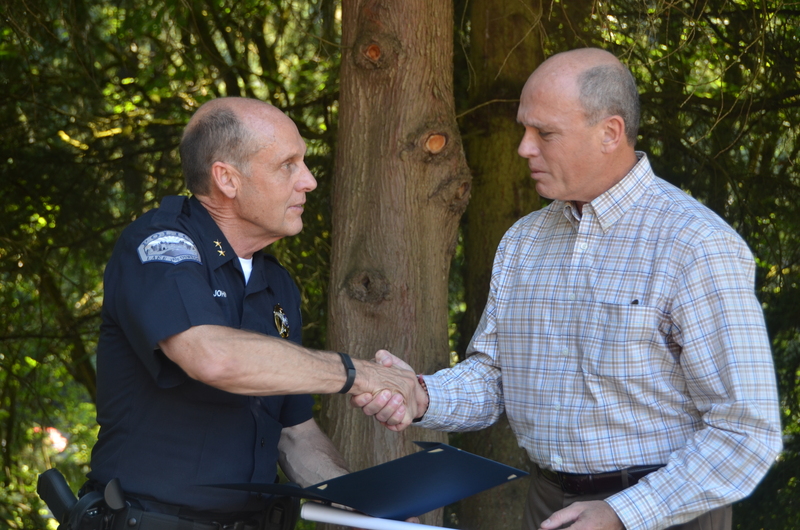 The Lake Oswego Police and Fire departments are proud of Leonard’s actions on that day and commend him for his selfless act.